January Commenter of the Month Competition Winner! As you know we started the Darknet Commenter of the Month Competition on June 1st and it ran for the whole of June and July. We have just finished the eigth month of the competition in January and are now in the ninth, starting a few days ago on February 1st – Sponsored by GFI. Pantagruel is it your turn yet? January has been an extremely active month for comments with some interesting discussions happening, I’d like to thank you all for your participation! I hope it keeps getting better as 2008 develops with more interesting news and tools. We are still waiting for pictures from backbone, Sandeep and TRDQ, dirty and dre and Sir Henry of themselves with their prizes! 21 Responses to January Commenter of the Month Competition Winner! It feels good to be recognized. Thank you all, for I couldn’t have done it alone. And with that being said, nobody_holme, pantagruel, mulble and others.. let’s keep those discussions going! Congrats! Sorry for not adding to the discussions as of late. My new job is under way and I am all over the place. Next week I will be in Ottawa in the event that any of you is located there. Why do i feel that it’ll be panta this month? Anyway, as long as people keep doing stupid insecure idiocies, or coming up with new useful tools, I’ll be here. Hope I can win this pack sometime soon. Good Golly, the prizes have arrived! The package contained a t-shirt, a mug, a pen, a pencil and two keycords. Unfortunately no ipod or psp but I guess that’s too much to ship overseas. Thanks anyway and I will send a picture of me and my winnings shortly. The prizes will arrive in two parts, the main prize should be shipped direct from a vendor in your part of the World, so it takes a little longer to find one and place the order. Sounds like you and I received the same package, save for I only got one key cord. No psp/ipod, either, but did not envision that I would get one, anyway. Not sure why. Congrats, again. Nor was there any expectation on my part. Hopefully it was not conveyed in my comment that I was expecting anything mentioned. Just more of a statement. In reality, receiving what I did was just a nice-to-have on top of the phenomenal discussions that we have had. I am glad the wrist is getting better. I think I may be falling apart, as well. I will be 31 on Friday and am beginning to think that there may be something to this degeneration concept. Then just imagine.. I’ll be 44 next month! btw, how’s the new job? Sorry to hear about your wrist. I hope you get better soon! Also happy early birthday mate! Hope you’ll have many more! uhhm, guys.. I just received a Creative ZEN mediaplayer in the mail. 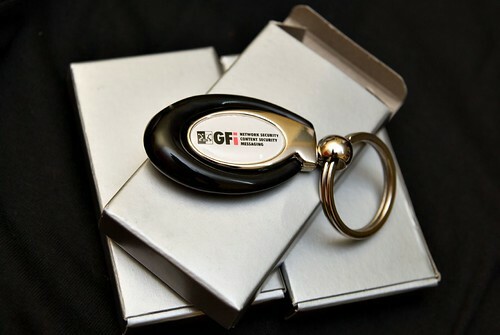 Compliments of GFI software.